On the dinner plate, Chicken has been the reigning king of fowl for far too long. I’ve been asking my meat market to stock a more diversified fresh poultry section, but apparently, I’m the only fool asking for such. Any poultry other than chicken and ground turkey gets banned to the frozen foods department: quail, duck, goose and turkey. (Guinea fowl, partridge, pheasant and pigeons can be had but only on special order). I’m on a quest to lay off chicken for a while and explore some of the “other poultry”- both in the kitchen as well as on our homestead. While it’s a little too early to talk about the 20, 18, 17 duck eggs that we’re incubating (they’ll hatch this week), our plan all along is to raise our own meats. Oh, before any of my readers freak out, no we haven’t cooked Duckie Momo or Nibbles. Both of them are on the “protected list” and are considered our pets. The past two weeks of recipe testing were devoted to taking one of the most elaborate Chinese dishes and creating a no-fuss, simple recipe that anyone can make. 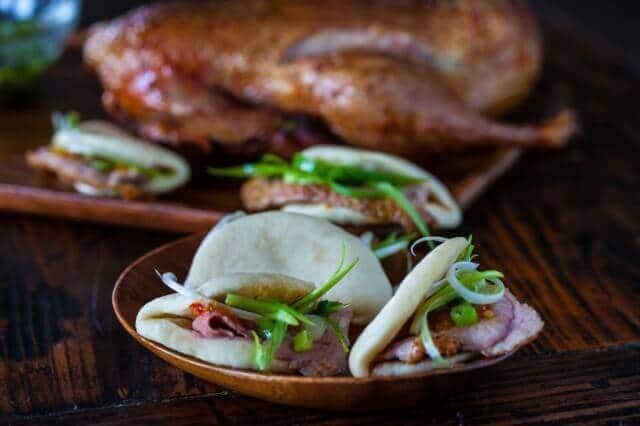 Have you ever tried one of China’s most celebrated dishes – the sublime Roast Peking Duck with its crackling, crispy skin served in a fluffy Chinese steamed bun? It’s a complicated, multi-step recipe that involves air-drying the duck, blowing the duck to separate the skin from the body (essential to get the crackly-thin skin), pouring boiling water over the duck to tighten the skin, and roasting the duck while hanging (the duck, not you). If you’re interested, Serious Eats has an easier version. 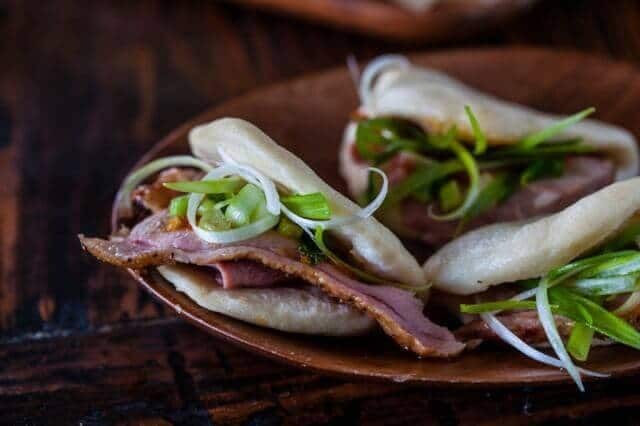 I wasn’t interested in getting my version of the recipe to match Peking Duck, but rather to create a recipe that we could build on and that any kitchen novice to tackle. I distilled the dish to just 3 main ingredients. 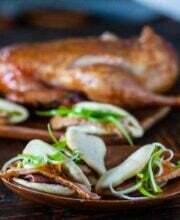 The original Peking Duck is slathered and basted with a sweet/salty liquid of soy sauce and honey. I opted to simply season the duck with salt and pepper. Why make it any more complicated than than, when the duck itself has such incredible flavor? I’m using our outdoor wood-fired grill from Memphis Grills, which acts as our outdoor oven. Yes, it’s wood-fired! We use 100% hardwood wood pellets that fuel the grill. It’s cleaner and healthier than charcoal and gives everything we cook a natural wood-fired taste. You can roast your duck in your oven or out in your BBQ grill. 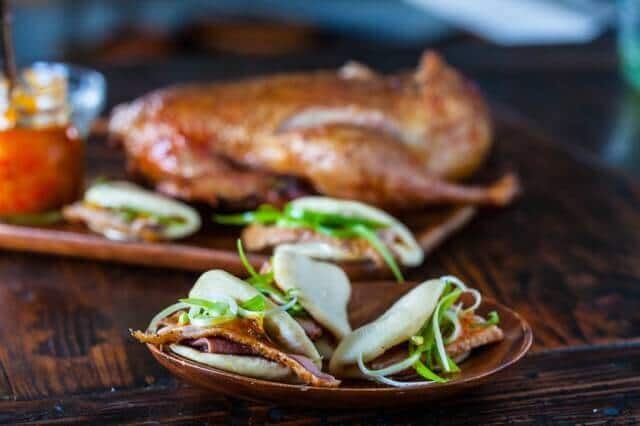 The most foolproof method of cooking duck is low and slow to keep the meat moist and tender — and then finish off with a blast of high heat to crisp up the skin. In Asian cookery, green onion (or scallion) is used more than just for garnish. Raw green onion, cut into very thin, long slivers and soaked in ice-cold water adds curly crunch texture! Plus, soaking it in water mellows out the spicy/harsh flavor of raw green onion. Give it a try. Here’s a more in-depth post on how to do this as a garnish. In addition to curly-crunchies, I also minced some of the green onion with salt and flash-cooked with smoking-hot cooking oil to make “Scallion Oil.” It’s easy. It takes 5 minutes. Okay, get ready for my secret ingredient. Prepared dough! This is a trick I learned from my Mom. 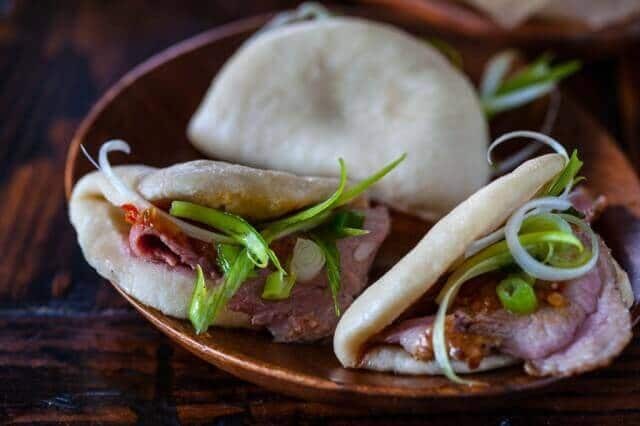 A can of prepared sourdough biscuit dough creates light, fluffy, pillowy steamed buns! All you have to do is roll out the dough discs into ovals and fold over. Steam for 8 minutes. Done. The only thing missing now is the Sweet Chili Sauce, which you can make yourself, purchase (try finding Mae Ploy brand) or use purchased sweet plum sauce. 1. To clean the duck, I like to give it a little salt rub to thoroughly clean the skin. Rub a handful of kosher salt all over the duck. Give that duck an exfoliating scrub! Rinse all salt away and pat dry. Season duck with salt and pepper, inside and outside. Cut away and discard any extra fat. Stuff the duck with the ginger and garlic. I like to sew the cavity shut, but it's not necessary. OVEN COOKING: Place duck, breast side up in roasting pan with rack. Roast duck at 300F for approximately 45 minutes per pound, or until internal temperature of duck is 160F. Turn up the heat to 450F and roast an additional 5-8 minutes to crisp up the skin. GRILL COOKING: Prepare for indirect cooking at 300F. Have a drip pan as well - the duck is very fatty and you'll want something to catch the fat. Roast until internal temperature of duck is 160F, approximately 45 minutes per pound. Turn up the heat to high and roast an additional 5-8 minutes to crisp up the skin. 2. 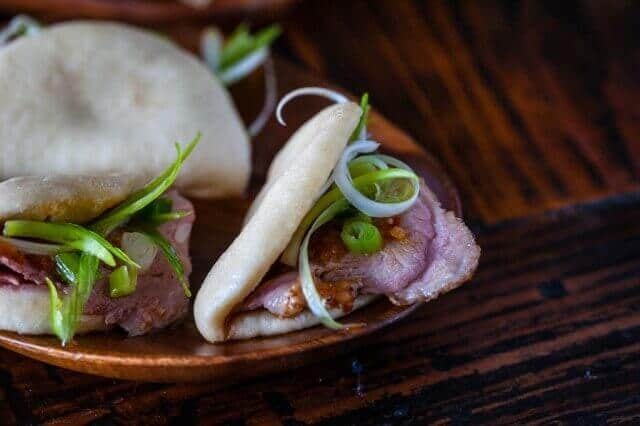 While the duck is cooking, let's prepare the scallions and bun. SCALLION OIL: Mince 4 stalks of green onion. Place in a large, heat-proof bowl (like Pyrex or Corningware). Set aside. CURLY-CRUNCHY SCALLION: With the remaining 4 stalks of green onion, slice as thin as you can at a very steep angle. Place in a bowl of ice water. BUN: Flour clean surface to work on. Roll each biscuit into a oval shape. Fold over in half and place on a square of parchment paper. Cover with plastic wrap and set on counter until ready to cook. 3. 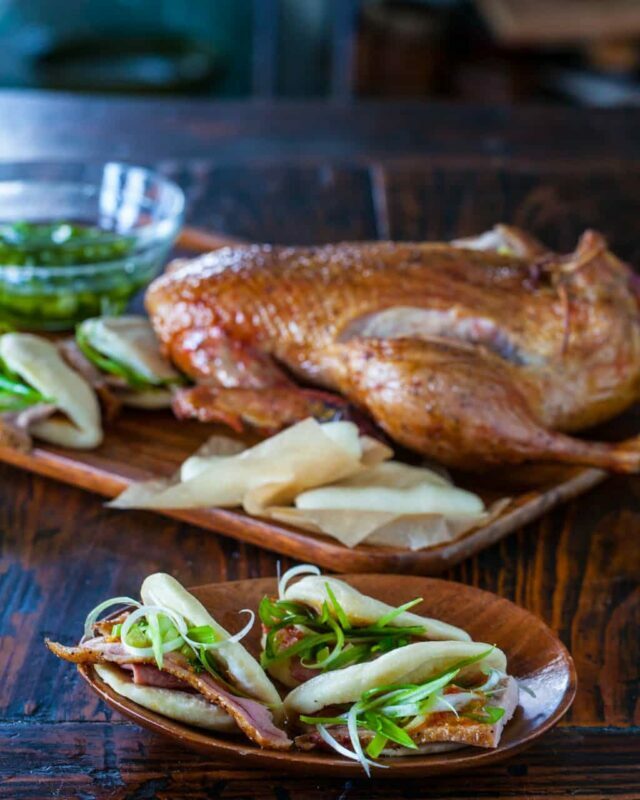 Once the duck is cooked, remove from grill or oven and let rest while we steam the bun and make the Scallion oil. BUN: In a large wok, bamboo steamer or large saute pan, add 2 cups of water with 1 tablespoon white vinegar. When boiling, steam the buns for 8 minutes on medium heat. SCALLION OIL: While the buns are steaming, in a small pot or frying pan, heat up the 1/2 cup of cooking oil until the oil begins to smoke. Carefully pour the super-hot oil over the minced scallions and salt, mix well. 4. 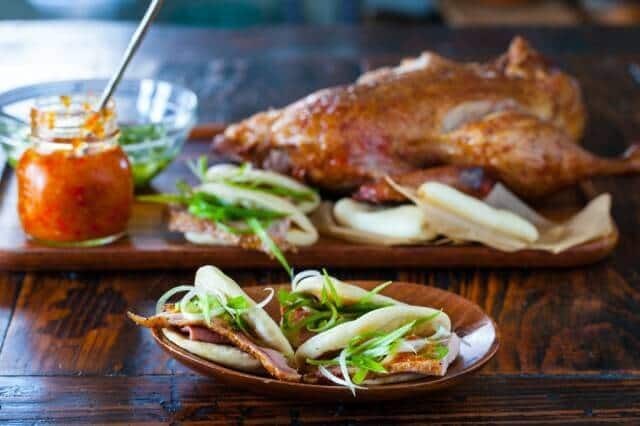 Carve the duck at the table, slice the duck breast into very thin slices to eat in between the steamed buns! Add a little Scallion Oil, Curly-Crunchy Scallion and Asian Sweet Chili Sauce.